Reading Mahāyāna Buddhist literature you will find reference to many bodhisattvas who are not so well known in the present day, yet historically had a significant role in iconography and popular practices. In the East Asian context it is Japan which best preserved the artistic traditions (in particular sculpture) which brought these figures into the world for all to see. 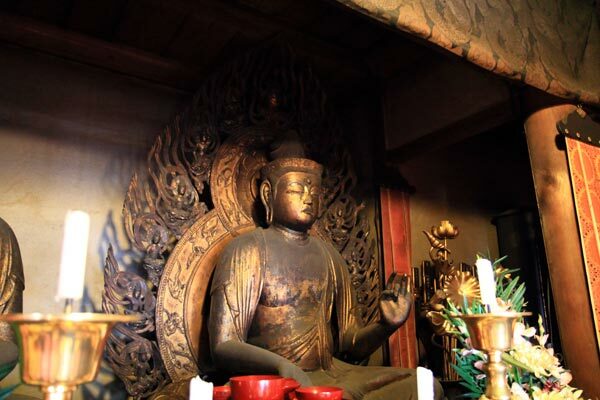 The Japanese initially inherited such traditions from the Korean peninsula and China, though unfortunately the vicissitudes of history were not kind to Buddhism on the mainland. In Japan you can find wooden sculptures dating back to the Asuka Period (592-710), which corresponds to the Sui (581-618) and early Tang (618-907) periods in China. Such preservation is nothing short of remarkable. There are a few noteworthy bodhisattva figures which are well represented in the ancient Japanese Buddhist artistic tradition which I want to take a look at here. They have served for many centuries as objects of devotion and inspiration, but also have had a role to play in Buddhist practice as well. Mahāsthāmaprāpta Bodhisattva 大勢至菩薩 is one such figure. He is known for his great wisdom with which he eliminates confusion. He flanks Amitābha Buddha with his fellow attendant Avalokitēśvara. The triad are said to greet devotees and guide them to the Pure Land at death. In contrast to Avalokitēśvara's compassion, Mahāsthāmaprāpta illuminates everywhere with his wisdom. In one sense he represents the wisdom of Amitābha. The pair are described in the Sukhāvatīvyūha Sūtra 無量壽經 and the Sūtra of the Meditation on the Buddha of Immeasurable Life 觀無量壽經. The latter has Avalokitēśvara to the right of Amitābha and Mahāsthāmaprāpta to the left, whereas in the esoteric tradition their sides are reversed. The three are conventionally called the holy beings of the west (i.e., the western Pure Land). In esoteric tradition he is one of the eight great bodhisattvas, appearing in the Hall of Avalokitēśvara 觀音院 in the Garbhadhātu Maṇḍala 胎藏界曼荼羅. His name does differ however throughout esoteric scriptures. According to the Karuṇāpuṇḍarīka Sūtra, following the pariṇirvāṇa of Amitābha, Avalokitēśvara will take his place as next in line for buddhahood and thereafter Mahāsthāmaprāpta will follow Avalokitēśvara. In Japan there are scarce specimens where he is alone, never having gained the popular following of his fellow attendant. Another famous triad includes Bhaiṣajyaguru 藥師如來 (Medicine Buddha) and his two bodhisattva retainers Sūryaprabha 日光菩薩 (Sunlight Bodhisattva) and Candraprabha 月光菩薩 (Moonlight Bodhisattva), who are said to be the chief bodhisattvas of Bhaiṣajyaguru's buddha-realm and also his immediate successors to buddhahood. Together the three are called the holy beings of the east (i.e., the pure emerald world of the east). Bhaiṣajyaguru is chiefly associated with healing while the pair are charged with the task of protecting the teachings of the Tathāgata. 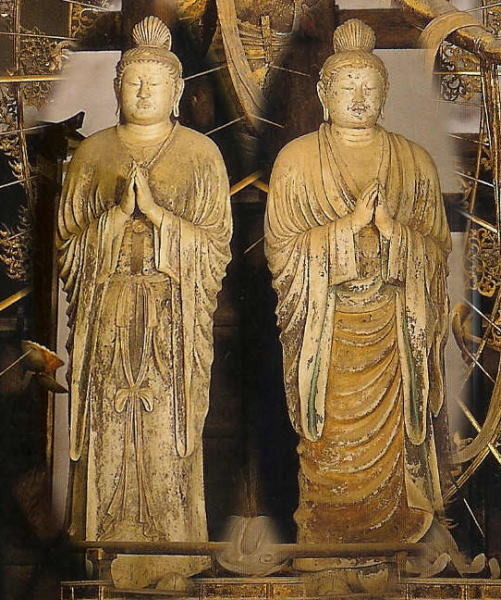 As far as the art record goes in Japan, the pair are almost always alongside Bhaiṣajyaguru. There are almost no examples of them being crafted as single individuals. 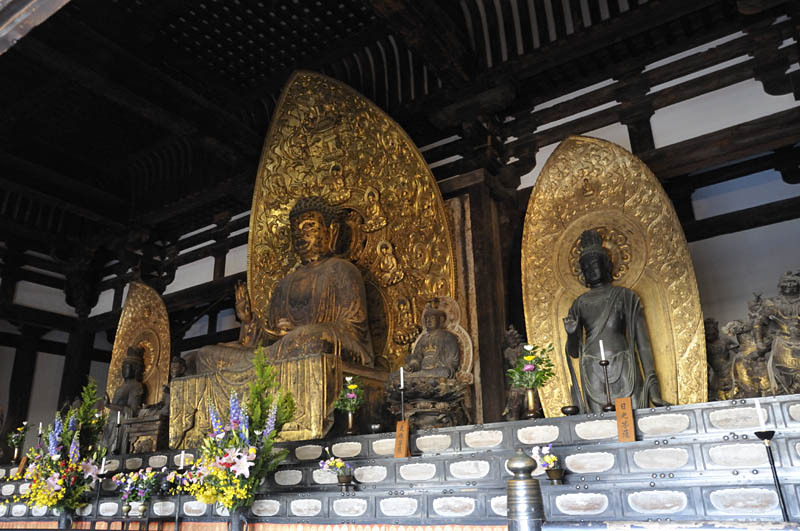 One famous example of the triad in Nara, Japan is at Tōkōn-dō 東金堂 at Kōfuku-ji 興福寺 pictured here. On the left side of Bhaiṣajyaguru is Sūryaprabha with Candraprabha on the opposite. The central bronze image of Bhaiṣajyaguru is from 1415, though the flanking pair are from the Nara period (710-794). In the esoteric tradition Candraprabha appears in the Vajradhātu Maṇḍala 金剛界曼荼羅 and Garbhadhātu Maṇḍala. Sūryaprabha appears in the latter. As with Mahāsthāmaprāpta, these figures also have secret names within the esoteric context. This is a feature to the developed esoteric literature: exoteric figures all have their secret designations. They might also have alternative appearances. The pair are also associated with the Great Compassion Dhāraṇī of Avalokitēśvara. Candraprabha and Sūryaprabha along with immeasurable deva-s increase the efficacy of the incantation when anyone sincerely recites it. Likewise, the two have their own respective dhāraṇī-s which when recited offer protection and elimination of obstacles such as demons, disease and natural disasters. According to one myth, long ago during the time of Vidyutprabha Tathāgata there was a Brahman raising two sons. Driven by the chaos in the world he generated bodhicitta and vowed to liberate all suffering beings. His sons vowed to make offerings. Vidyutprabha Tathāgata praised him and encouraged him to take the name Medicine King, and his sons to take the names "Sun Illumination" and "Moon Illumination". Later this Medicine King became Bhaiṣajyaguru with his two sons as retainers who became bodhisattvas. 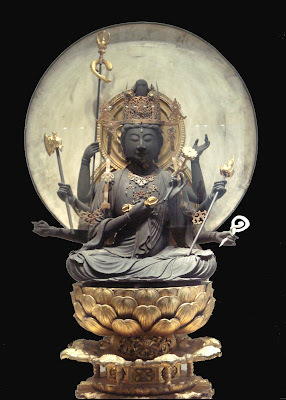 Ākāśagarbha Bodhisattva 虛空藏菩薩, otherwise known as Gaganagarbha, is another prominent bodhisattva that is not so well known in the English speaking world. As his name implies, he is like a limitless treasury of wisdom and merit. In the Ākāśagarbha Bodhisattva Sūtra the Buddha praises all his good qualities. His samādhi is like the sea. His pure precepts are like a mountain. His wisdom is like space. His effort is like the wind. His tolerance is like diamond. His wisdom is like the sands in the Ganges. He is the proper guide for people and refuge for both preta-s and animals. He is thus worthy of receiving supreme offerings from beings. As a figure like Mañjuśrī he represents wisdom and knowledge, though Ākāśagarbha Bodhisattva also encompasses arts and skills. In Japan his devotees consequently came to include artists and craftspeople. This is recorded in a smaller esoteric text translated in 717 by Śubhakarasiṃha (637–735) (T. 1145, 虛空藏菩薩能滿諸願最勝心陀羅尼求聞持法) which teaches the dhāraṇi along with a particular ritual as a means of eliminating obstacles and receiving protection. It also fosters the ability to hear and retain all teachings (i.e., memorization of what is heard or read) without forgetting anything. This is still practised in modern Shingon. This practice was incidentally part of the early training of the Japanese Shingon patriarch Kūkai 空海 (774-835). During his time at university a certain monk, possibly either Gonsō 勤操 (758–827) or Kaimyō 戒明 (d. 806?) in Nara, introduced him to it which he performed in seclusion in Shikoku. As the story goes, he was doing this practice at Muroto Misaki 室戸岬 (in modern Kōchi prefecture) when the morning star Venus on the horizon suddenly appeared before him and descended into his mouth resulting in a profound mystical experience. The star was said by Kūkai to have been a manifestation of Ākāśagarbha Bodhisattva. This experience during his youth fostered even greater faith and motivated him in his practice, which eventually led him to China where he pursued his studies. Another popular figure of the past was Mahāpratisara Bodhisattva 大隨求菩薩. She is part of the Avalokitēśvara group in the Garbhadhātu Maṇḍala. As a transformation of Avalokitēśvara she sees to all prayers being answered while eliminating hardships and obstacles. These activities are associated with her dhāraṇi, which is taught in the Mahāpratisara Dhāraṇi Sūtra 大隨求陀羅尼經. One unique feature of this dhāraṇi, as described in the translation by Amoghavajra (705-774), is that if a bhikṣu (monk) has violated their precepts and should fall ill with a serious condition, an upāsaka can write the dhāraṇi and tie it to his head. Even if the ill bhikṣu dies and falls into the hell realms, it is through the merit of the dhāraṇi that they will be freed from the agonies of hell and born in the Trāyas Triṃśa heaven. The texts describes this as having happened once. It is common in later developed esoteric literature for mantra-s and dhāraṇi-s to promise increasingly powerful and wide ranging abilities in contrast to ones which work for a specific function. The text in question has stories which describe how someone having recollected the dhāraṇi was saved from fire and poison. The incantation possesses the blessings of all tathāgata-s and is thus said to bestow all manner of protections on the practitioner. In the maṇḍala iconography she appears yellow with a jewel cap, therein a manifest buddha emerging. She possesses eight arms. On the right she holds a five-pronged vajra, sword, axe and trident. On the left she holds a dharma-cakra lotus, rope, jewelled parasol and palm-leaf scripture. There are however variations on the items she carries. Each hand has a particular mudrā associated with it and corresponding mantra. Curiously in Japan the practices associated with her were often used for the well-being of women in childbirth or for those seeking to have children. From the Heian period onward she was a popular icon. There are of course many more bodhisattvas, buddhas and deities within the Buddhist pantheon which were at some point in the past very popular in various cultures. We looked at some aspects of strong polytheism in Buddhism in an earlier post Buddhism is Pagan as well as the practice of summoning (sorcery) in Buddhist Sorcery in East Asia. Again, we need to bear in mind that such magic and devotion to deities effectively were Buddhism to many people in the past, both in the Sinosphere and Indosphere. Arguably this is still the case in many places. The truth is the rich philosophy of Buddhism many study today was rather marginal as far as Buddhism on the ground was concerned in various cultures and time periods. For instance, in the East Asian context it might seem that Chan and Zen practices were widespread, but overall deity worship and magic were, and still are, far more commonly known and practised. In a future post we will take a look at some more major Buddhist deities who have gone to the wayside in modern times. Thank you for this guide. As a white American practitioner of Tibetan Buddhism I am often curious when I see pictures of unfamiliar Bodhisattvas taped on the walls of Chinese shops. This is helpful. Dumb question: Do the Chinese Mahayana traditions assume that none of the Bodhisattvas have attained Buddhahood other than Shakyamuni Buddha, Amitabha and Medicine Buddha? Generally speaking a bodhisattva has not yet attained buddhahood, but it can get rather ambiguous. In passing a bodhisattva can be called a buddha, especially in casual speech. 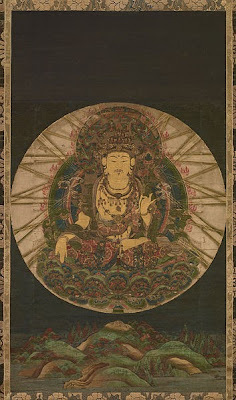 In more esoteric lines of thinking some bodhisattvas are representative of a power or manifestation of a given buddha. I would say in general though a bodhisattva is thought not to have attained buddhahood yet, as is the case of Amitabha Buddha's attendants who will succeed him later on.